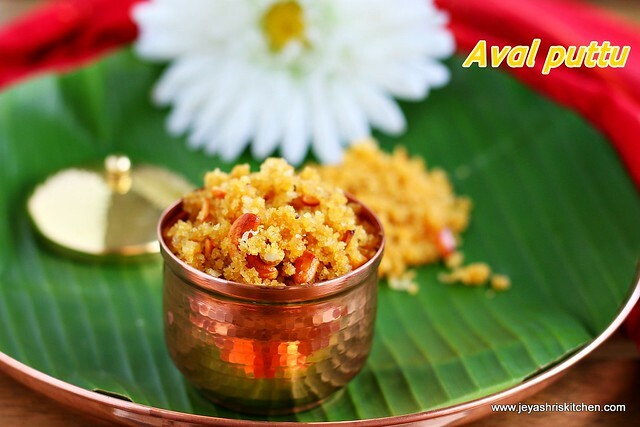 Aval vella puttu is a traditional dish made with poha and jaggery as a main ingredient. I have already posted arisi vella puttu recipe with video, this is even more easier on made using aval. Though i have tried this few years back, i didn't get the consistency right that time. But now after asking tips on making puttu from one of our close family friend , I tried at home yesterday. It turned out well and was too soft too. As today being thai velli and pournami (full moon day) i thought i will post the recipe of aval vella puttu, as we call in tamil. If you are a sweet lover just make this easy recipe at home and enjoy the puttu. Pulse the poha | aval in a mixie to get a rava consistency. Do not make it a powder. Sprinkle 2 tblsp of hot water to this and gently mix it together and keep it aside for 10 minutes. After 10 minutes the poha would have observed the water and sprinkle 1 or 2 tblsp of water to it. Keep it aside for 10 minutes. Now the poha|aval will be very soft. Melt the jaggery in a pan by adding 2 tblsp of water to it. Filter for impurities if any and boil this again. We need to get a hard ball consistency. You can check this by adding little jaggery water to the a small bowl of water. If you could make a hard ball out of this then the consistency is perfect. Switch off the flame. Add the aval to this and mix evenly. Add the cardamom powder and coconut. Mix well. 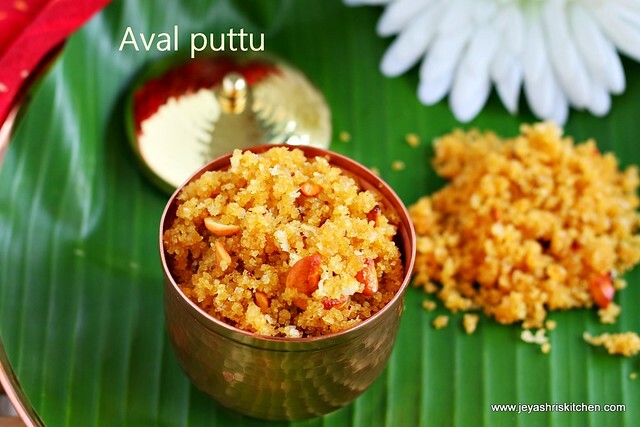 In 1 tsp of ghee fry few cashew nuts and add it to the aval puttu. If you do not want to add cashew nuts just add 1 tsp of ghee only. Aval vella puttu is ready for neivedhyam. Sprinkling hot water makes the puttu soft. Do not sprinkle water and make the puttu immediately. Do not add too much water at a time. Slowly sprinkle water to get the sandy texture. This puttu stays soft for more than 3 hours. Keep in a airtight container to retain softness. The jaggery was just perfect, if you need this more sweeter, add 1-2 tblsp extra and not more than that. Thanks for posting this recipe.Long time back one of my colligue gave this recipe to taste. since its so tastier i tried 3 to 4 times, but i coulndnt get the right consis. now i understood the tech that thick ball consistency of jagg. to try it soon. Thank you. Try and let me know. Hi i use Ultra grinder for the past 15 years and it is quite good. You get the grinder in 2 different capacities. I hope you are asking the one which we used to grind Idli |dosa batter and not the blender. Well so I rather think the blender then. I need something so that I could mix the different kinds of spices in it. As it is in your pictures above I think that it is what I need. Sorry for the delayed reply. Blender you can buy preethi brand. I am using that for the past 10 years and it is doing well. Thank you for your advice, it looks very nice. Yesterday tried this recipe,came out well nd taste wise also good,but felt raw smell of aval, better roast before grinding.